This is the best beer can grilled chicken. Chicken is seasoned perfectly and turns out exceptionally tender and juicy, even the breast meat. I also offer an outstanding rotisserie chicken recipe below. Mix the above ingredients together thoroughly, or you can shake them together in a resealable bag. Set aside. Place all of the ingredients into a medium saucepan and bring to a boil over medium high heat. Reduce heat and simmer sauce for approximately 8-10 minutes. Set aside. Measure 2 tsp of the basic grilling rub and sprinkle inside of the bird cavity. Cut tiny slits in the chicken skin and rub with olive oil and vinegar. Sprinkle the outside of the bird with another 2 tsp of the rub. Pull the tab off the beer can and poke a few holes in the top of the can. Pour out 1/2 of the beer (or drink it), and if there is any rub left - pour that into the remaining half can of beer. It may foam but that is normal. 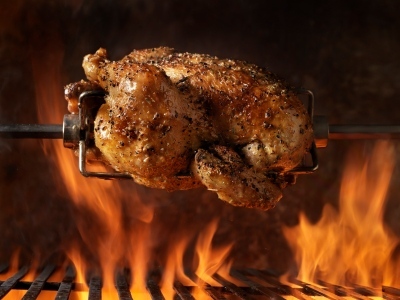 Place the chicken over the beer can and in the hot grill, stand the bird directly over the drip pan - spreading the legs of the bird to form a tripod. Cover the grill and cook the chicken until the skin is a dark crispy golden brown; and the meat is 175 degrees - which is approximately 1 to 1-1/2 hours. If you are using charcoal, you will need to add 12 fresh coals per side after one hour. Just before the grilled chicken is done, brush with the barbecue sauce and cover the grill for 3 minutes or until the sauce is hot. Take the chicken off the grill (BE CAREFUL - BEER IN CAN IS HOT) and let it rest 10 minutes. Remove the can and carve the chicken. Use the additional bbq sauce when serving. 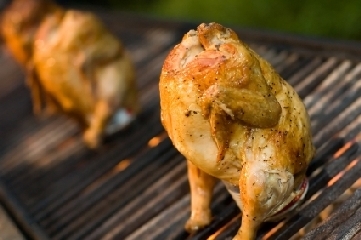 I think this is an awesome beer can grilled chicken recipe. This is a dry rub and the chickens need to chill in the refrigerator for at least 24 hours before roasting. Mix all of the rub ingredients together in a small bowl. Remove the giblets and discard. Wash the chickens thoroughly and pat dry with paper towels. Rub each chicken inside and out and place in a resealable bag; wrapping again in foil. Chill in the refrigerate to marinate for at least 24 hours. DO NOT skip this step. Prepare the rotisserie and place the chickens on it. Roast until done and ENJOY. You may also slowly roast the chickens in the oven. Preheat to 250 degrees and place the chickens in a roasting pan and cook uncovered for 5 hours, or until a meat thermometer reads 170 degrees in the thickest part of the chicken. Drizzle the chickens with the pan drippings and wrap in foil. Let sit for at least 10 minutes before carving. To make chicken gravy, add a can of chicken broth mixed with 1 tablespoon cornstarch to the pan juices, and let boil till thicken. In a hurry? Use 5 or 6 chicken breasts or thighs with bone. Skip the onion and marinating. Instead, toss seasonings & chicken in a large oven roasting bag, shake till chicken are all evenly coated. Bake in 350 degree oven for 1-1/2 hours. I have more than just a beer can grilled chicken recipe, click on the link below for more grilling recipes.